Are the CJK Extensions and HKSCS turned off by default? Q: Can I type or handwrite Cantonese and other uncommon Chinese characters in Windows? Why don't those characters show up even when I have the right input method installed? Aren't these characters included in my Windows fonts? A: The Unicode CJK Extensions and the Hong Kong Supplementary Character Set (HKSCS) are included with the Taiwan, Hong Kong, and Macau regional settings, but but are turned off in most of their input methods. I will show you how to enable these character sets for keyboard and handwriting input. If you still need more fonts or more information after all that is done, I have a few ideas for you. The Cantonese Phonetic IME (CPIME) includes HKSCS by default. Or at least, I think it does. All Cantonese characters I have tried to bring up with CPIME have appeared. At the time of this writing there are no control panel options available for this input method editor, but it makes sense that this feature would be switched on for CPIME. 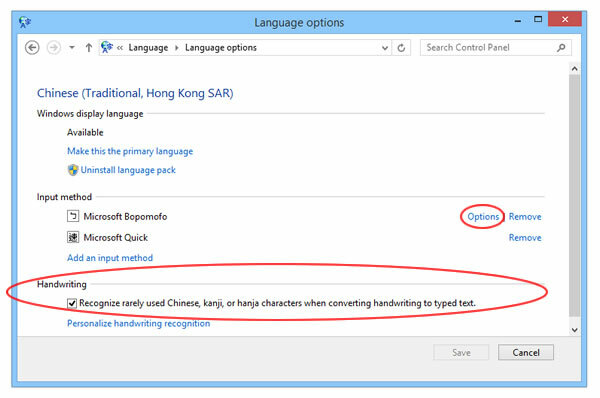 For more information, see the FAQ page on how to select Cantonese Phonetic IME (CPIME) in Windows 10. Other input method editors for the Taiwan, Hong Kong, and Macau regions offer HKSCS and Unicode CJK extensions as an option. 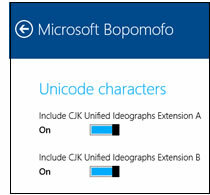 At the time of this writing, the location of these options is not consistent: for Microsoft Bopomofo this is in an old-style "additional settings" control panel, but for Microsoft Quick (at the time of this writing) it's only available in the newer Settings panel. while this IME is selected, right-click on the "CH" button. The Language control panel will appear. The Language control panel will appear. one way to get there is to select "Language preferences" at the bottom of that menu. The Time & Language settings panel will appear. In "Region & language", under "Related Settings" click "Additional date, time, & regional settings. The Language control panel will appear. In your Traditional Chinese region, click "Options", and then in the next panel click the "Options" link for Microsoft Bopomofo. 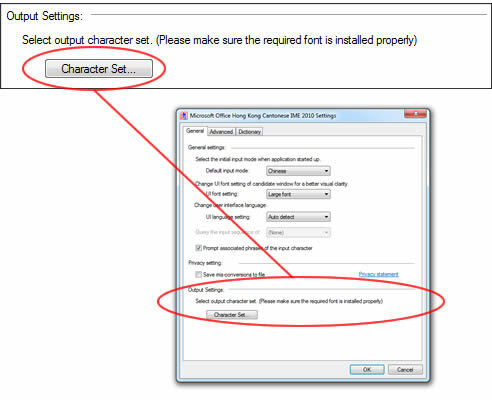 Then in the Microsoft Bopomofo Settings control panel, in the "General" tab under "Output Settings" click the "Character set" button. 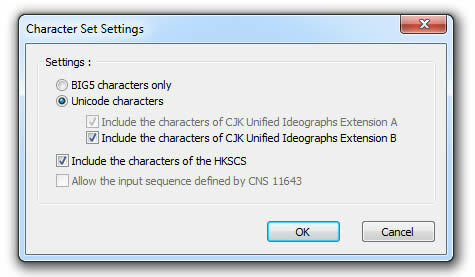 Select "Unicode characters" if that is not already done, then click the box next to "HKSCS characters". This will automatically also select both Unicode extensions above. Only one of those two is optional, and I suggest you leave them both selected (unless you are using a very old PC or slow tablet). If you don't know what the option for CNS 11643 is all about, just ignore it. HKSCS may be on by default in Quick, but it's good to check on this anyway. For both Quick and Cangjie (I refuse to spell that with a "Ch"...) go to Settings and then "Time & Language". In the "Region & language" section, click your Traditional Chinese region and select "Options". 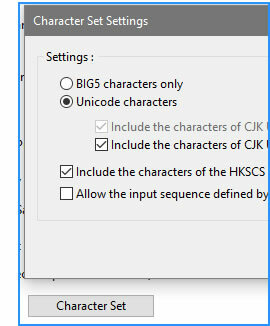 Then separately click on Quick and Cangjie, click "Options", and at the bottom of the settings you'll find options for Unicode and HKSCS. I suggest you turn them all on unless you're using a very old PC or slow tablet. These two do not offer HKSCS and Unicode options. I do not know much about them, but I believe they probably rely on the Big5 character set. The Traditional Chinese handwriting feature offers an option to "recognize rarely used Chinese, Kanji, or Hanja characters when converting handwriting to typed text". You'll have to download and install handwriting before this option will appear. 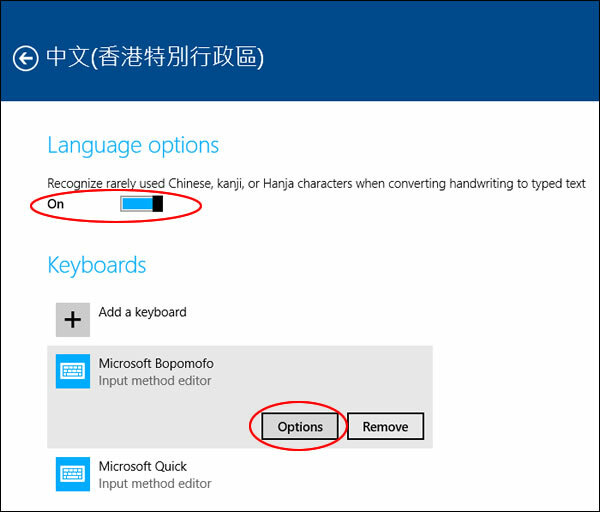 See the Windows 10 Chinese handwriting setup page. For Windows 8 keyboard input methods, the additional character sets must be enabled separately for the Desktop and tablet (Metro/Modern) sides of the operating system. • Press <Windows + i> (that is, the Windows key plus the letter "i"). • Under "Clock, Language, and Region", click "Change input methods". • In the "Handwriting" section click on the box for "Recognize rarely used Chinese, kanji, or hanjia characters when converting handwriting to typed text." ◊ Also in the General tab, I recommend you select "Prompt associated phrases of the input character", and in the "Dictionary" tab I recommend you select "Enable personal regulating" and "Dynamic character order based on usage". ◊ Now click "OK" to close that control panel. • Click the "Save" button and close the Language control panel when you are done. When typing Chinese, note that the candidate list can be expanded for a full view of the whole list. See my FAQ page on the Traditional Chinese IME Candidate List. *These changes should also affect the character set in Quick and other IMEs. • Select "Change PC Setings" at the bottom of the charms panel. • Select "Time and Language", then "Region and language". • Under "Languages" select your Traditional Chinese region, then "Options". • For handwriting, under "Language Options" turn on "Recognize rarely used Chinese, kanji, or hanjia characters when converting handwriting to typed text". ◊ and also "HKSCS" if offered there. For information on setting up the Touch Keyboard and the IME Pad, see my article on Windows 8 Chinese handwriting. Install the Traditional Chinese 2010 input method update. This will give you the Hong Kong Cantonese 2010 keyboard, and also update your phonetic Mandarin and non-phonetic Changjie and Quick input methods. 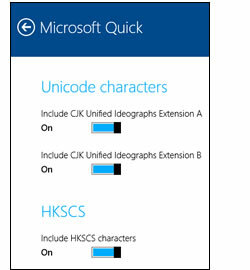 After those installations, you will still need to enable CJK extensions and the HKSCS for your keyboard input methods. On the taskbar language band, select "CH" for "Chinese (Traditional, Taiwan"). 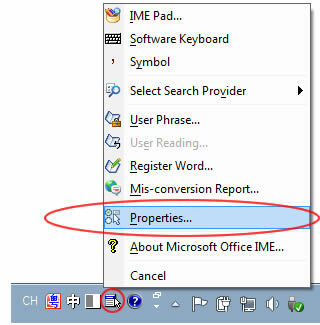 Then click the Tool menu, and in the menu that appears select "Properties...". Changing the character set for one Traditional Chinese keyboard input method changes it for all as far as I know. Select "Unicode characters" and either or both extensions. 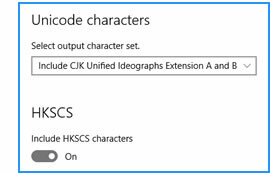 Selecting "Include the characters of the HKSCS" will automatically select CJK Unified Ideographs Extension A, with Extension B optional but recommended. Click the "OK" button. Also in the General tab, I recommend you select "Prompt associated phrases of the input character". • "Dynamic character order based on usage". Now click the "OK" button to return to your work. When you begin typing Chinese, at first the characters you want may be way down the candidate list, but that list can be expanded for a full view of the whole list. See my FAQ page on the Traditional Chinese IME Candidate List. If you use the Tablet PC Input Panel to handwrite Chinese in Windows 7 Ultimate (after installation of the Traditional Chinese language pack) or Windows Vista, you can expand the character set there too. To open this panel the first time, go to the Start menu and in the search box there type "Tablet PC Input Panel" to find it. For instructions on putting it in the taskbar, moving it, using it, etc., see Microsoft's Tablet PC Input Panel help pages. 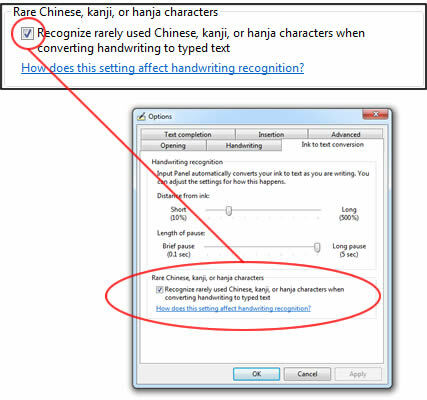 Then in the control panel that appears, select "Recognize rarely used Chinese, kanji, or hanja characters when converting handwriting to typed text". Then proceed to the previous section above, "Windows 7 and Vista", and follow my instructions there. For Windows XP SP2 and earlier, install the Microsoft HKSCS-2001 font update for your version of Windows, and also install the Microsoft 2003 IME update if you can. For Cantonese phonetic input on Windows XP SP2 or older systems, it's been a long time and the only option I can think of now is CPIME: http://cpime.hk/ Microsoft has acquired the rights to CPIME for Windows 10 with Jyutping only, but older CPIME versions also offer Yale, Sydney Lau, and Standard Cantonese Pinyin, so CPIME may also be interesting to owners of other Windows versions that can update only to the Microsoft Hong Kong Cantonese 2010 Jyutping update. The non-phonetic Changjie and Quick input methods area also available in Windows. The IME Pad can also be used, to input characters using handwriting, radical, or stroke look-up. If you don't know where or what that is, look at the top of the menu in the next image, and at the IME Pad image the end of the next section. If you need even more Chinese characters, I highly recommend the free Adobe Source Han Sans (also known as Google Noto Sans CJK) and BabelStone Han fonts. Yes, I said "free"! And open-source. See my survey of free and commercial Chinese fonts. OK? Feel free to contact me if you comments, questions or suggestions.